Performers include: Jason Isaacs, Jason Clarke, Annabeth Gish, Fiona C. Erickson, Brian Scannell, Kevin Chapman, Kerry O’Malley, Fionnula Flanagan, Madison Garland, Billy Smith, Frank Ridley, Ethan Embry, Brian F. O’Byrne, Tina Benko, Matt Servitto, Kailey Gilbert, John Fiore, Karl Bury, Georgia Lyman, Stivi Paskoski, David Catanzaro, Bates Wilder, Tom Kemp, Armen Garo, Len Cariou, Al Sapienza, Alan Dary, Damien Di Paola, Tony V., Ellen Becker-Gray, Rob W. Gray, and Giovanni Pantaleo. Set in Providence, Rhode Island, this drama revolves around a pair of Irish-American brothers — one’s a politician and the other’s a traditional criminal. Tommy Caffee (Jason Clarke) is the politician known as the “Prince of the Hill.” Tommy knows his constituents by name and helps them get civil servant jobs. He helps the poor and the elderly but he’s a pragmatist. He knows that loyalty translates into votes which translate into power which is what he hungers for. He works with Representative “Don-Don” Donatello (Matt Servitto), a lawyer who happens to represent several of the state’s biggest corporations. Tommy values family and friends but there have been bumps along the road, including some with his wife, high-school sweetheart Eileen (Annabeth Gish), and their rebellious and eldest daughter, Mary Rose (Fiona Erickson). 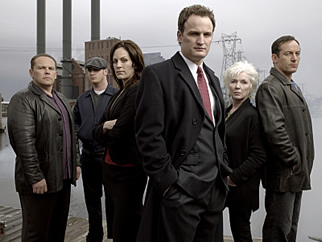 Following the death of local mobster Patrick Mullin, Tommy’s brother Michael (Jason Isaacs) returns to The Hill neighborhood. Michael’s been in hiding for seven years, since Mullin had vowed to kill him, and comes back to resume his old criminal business with Pete McGonagle (Stivi Paskoski). A recent head injury has left Michael even more unstable and paranoid than before. Michael works for prolific mobster Freddie Cork (Kevin Chapman), the man who began leading the Irish rackets when Michael left. Silent John O’Keefe (Brian Scannell) is his personal enforcer, a tight-lipped hulk who once bit a man’s nose off for a difference of opinion. When Michael went away, Kevin “Moe” Reilly (Billy Smith) was a punk who went for coffee. Moe now runs many of the businesses Michael left behind and he doesn’t like or respect him. Colin Carr (Brian F. O’Byrne) is the Caffee brothers’ cousin from Belfast, Ireland. With a history of hard living, he comes to the Hill and quickly becomes Michael’s right-hand man. Before he disappeared, Michael’s longtime girlfriend was Kath Perry (Tina Benko). While he was away, she got married and had two kids with a night watchman. Once Michael returns, it becomes clear who Kath truly loves. Though she works in a big box store for minimum wage, matriarch Rose Caffee (Fionnula Flanagan) is not one to be tangled with. She kicked her drunken and philandering husband out of the house when Michael was 12 and raised her three children alone. She gave most of her attention to the boys, virtually forgetting about her youngest child, Mary Kate (Kerry O’Malley). Mary Kate is now a social worker who supports Tommy’s campaigns but isn’t above twisting his arm. Her loyal husband, Jimmy Martinson (Bates Wilder), is a local lawyer who takes whatever legal work Tommy can throw his way. Declan Giggs (Ethan Embry) was a childhood friend of the Caffees and is now a police detective. He’s not above making moral compromises to gets his job done but is consistent in his love for his wife Cassie (Georgia Lyman), a haircutter. Also on the side of the law is Ellis Franklin (David Catanzano), an Assistant U.S. Attorney for Southern New England. He grew up in the rich side of providence and would like nothing better than to take down the Caffees and to make some splashy headlines to further his career in the process. Michael obsessively searches for Colin and Kath (who he believes are having an affair) while war with the New York mob is brewing. Meanwhile, the FBI, the police, and the Italian mob are looking for Michael. Donatello’s condition worsens and he has another stroke, making Tommy the heir apparent to become the Speaker of the House. He unfortunately has to make a commitment to Freddie before that can happen. Michael and Tommy must cope with the aftermath of these conflicts and face the drastic changes in everyones’ lives. First aired: First aired: December 21, 2008. Love this show. Came across it accidentally and began watching it from Season 1 back to back. I hope the network changes its decision and brings it back. Can’t believe this has been cancelled. It’s a great series and the cast is outstanding, especially Michael. Please reconsider and BRING IT BACK!